Natural hemp cord is the preferred choice for use in crafts, including jewelry making, scrapbooking, handmade cards, gardening and more! 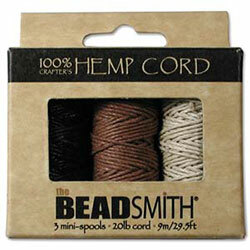 Hemp cord is a natural, biodegradable, and eco-friendly alternative to cotton and synthetic cordage. Each box contains 3 spools: 1 black, 1 brown, and 1 natural. Available in two sizes, 0.55 mm and 1mm diameters. There are appoximately 20 ft on each spool for the 0.55 mm and 10 ft for the 1 mm.